Welcome to the first "here's what I'm up against" article. So far most everything has been going smoothly and I really can't say that things are all that bad right now - just tight. Recently I posted a couple questions on the "Rodders Forum" asking others where the center of their steering column is in relationship to the left doorjamb or left side of the dash. As I lay this one out it seems to be a little closer to the door than I would like. Most articles on installing a steering column will tell you to get the seats first and line the column up where it's comfortable and centered with your seat. I'm afraid we don't have that option here. Not only will it be a while before we see the seats but we're limited on where we can mount the column. 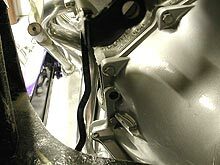 Normally when installing a column it's a good idea to have the shaft from the steering box enter the firewall as high as possible without exceeding the recommended maximum U-joint angle of 30-degrees. This will allow you to run the column at a flatter, more comfortable (and natural) angle. We won't have to worry about exceeding the recommended maximum U-joint angle. 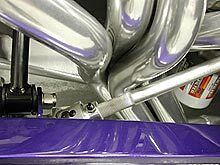 Because of the 3-inch engine setback and our choice of headers and steering box location the shaft will enter the firewall even with the top of the brake arm. I'm leaving about a 1/4-inch gap for comfort. 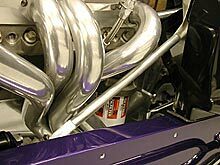 I don't want the headers to rattle on the steering shaft with engine vibration. This is tight enough! I should mention that all the splines you see on the steering shaft are because it hasn't been cut to length yet. This is a Flaming River aluminum piece. The shaft will be polished before final assembly. In this photo you can see how the column will line up even with the brake arm. You can also see the jog I added to the brake arm to move it farther to the right. This will keep it away from the column and give me room to use a Flaming River column floor mount. The jog in the brake arm is set up so it just clears the transmission bell housing and clears the side of the engine block by about 1/2-inch as it's depressed. Again, it's about as tight as you can safely go. 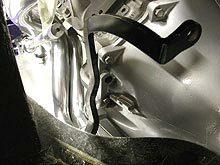 In this photo the brake pedal-mounting hole is about top center. We're looking straight down the brake arm. You can see the tight clearance with the steering shaft at the header from this angle. This view shows the brake and steering location from a little further away. 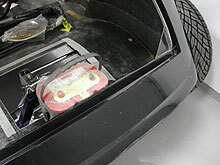 A piece of 2-inch masking tape temporarily holds the steering shaft in place. The column angle won't be bad using a 5 1/2" column drop under the dash. The only 2 things I'm concerned with now are that the column is closer to the door than I'd like and the gas pedal location may prove interesting. The center of the column, if I mount it perfectly straight, measures about 8-3/8" from the doorjamb - level with the striker - to the center of the column. I'll still have enough room between the steering wheel and the door but it's really about 1-inch further left than I'd like. Most guys said their columns fell between 9 and 9-1/2 inches from the doorjamb. I refuse to mount the column at an angle - I hate angled columns and could never live with one. Because of the transmission tunnel and brake location the gas pedal will probably need to be the hanging variety now instead of my previously planned floor mount type. 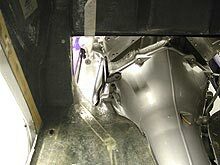 The fiberglass transmission tunnel that came with the body will need to be widened an inch because of the engine setback. In case you don't remember, the engine was set back 3-inches for radiator clearance because of the huge blower drive. A couple people have asked where the battery is going. This is where it'll be installed sometime in the future.